A while ago I posted about Eat In magazine and their award for Best New Product which went to Buffalo Ridge Mozzarella. I recently had the opportunity through Slow Food Cape Town, to visit the farm and learn about Mozzarella and how it is made. The farm is located in Wellington, about an hour from Cape Town. The farm is run on natural principles with no pesticides, herbicides or other ecologically harmfull substances allowed. The farm is technically organic, but not seeking certification. This itself is quite interesting as there are many farms out there that farm organically but are not ‘certified’ while there are other farms which are certified as organic but are less so. Another good reason why it’s important to familiarise oneself with the source of one’s food. That is the only way one can be certain that the food is produced as it should be. Wayne Rademeyer gave a presentation about mozzarella cheese, explaining the difference between buffalo mozzarella and cow mozzarella (and revealing that there is no such thing as ‘buffalo style’ mozzarella – don’t be ripped off!). He explained the cheese making process and answered our questions before bringing out a huge ball of fresh mozzarella cheese with olive oil and baby rosa tomatoes. It was fantastic! It was nearly two kilograms of mozzarella and we ate most of it! The buffalo are pasture fed, which is good for the animals and improves the nutrient content of the milk. Buffalo milk is higher in protein and calcium than cow or goat milk and is a viable option for people who are lactose intolerant. While the fat content of buffalo milk is higher, the fat content of the buffalo mozzarella cheese is lower than other cheeses due to the stretching process. Having tasted this awesome fresh, additive free buffalo mozzarella, I know I’m never going to be satisfied with any other mozzarella ever again! 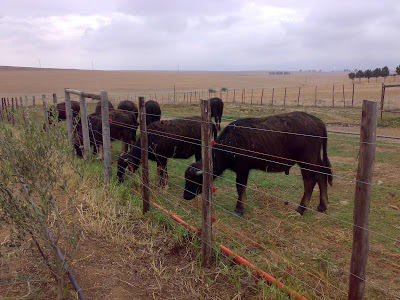 Buffalo Ridge farm is another Cape Town project which makes me really proud of this city. I’m pleased to see that consumers are demanding this product, allowing restaurants and delis to confidently support Buffalo Ridge. You can find a list of outlets on their website. Thanks for the mention. It is always a pleasure meeting like-minded people that you can share your passion with. PS our website will be up shortly. While the website is down, would it be possible to post directions – would love to visit? Also where about does it retail from and what is the price? Hi Greg, probably best to email those questions to Wayne directly (email at bottom of article). I know the farm is not usually open to visitors, but I’m sure he’ll let you know when they next have a group visiting. Dax is correct in stating that our farm is not usually open to the public. I’m often unavailable due to deliveries, etc. and it is difficult to welcome visitors during production. We will be addressing this in the future. If you care to email me your details, I will keep you informed on future events. Please email me if you require details of retailers in other parts of the country. Prices vary between the various retailers and I am honestly not familiar with all their prices. i am addicted to this stuff! i bought one tub for me and one as a potential gift… but the gift became a gift to myself, haha. if i didn’t have a huge stash of cheese from the cheese festival to get through, i would definitely be pining for more mozzarella. Great to see “real” cheese coming to SA. I know of another company too called Puglia cheese doing something similar although not with buffolo milk. I would love to taste the cheese so next time I am down that way I will definetly pop into Wellington and try some. I’d be happy to give you a bit of free publicity on one of my websites too if the cheese is as good as people say.